The next generation in garage door opener accessory systems has arrived. 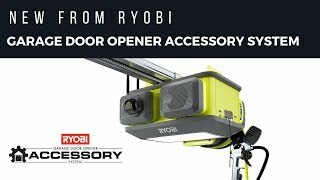 The RYOBI Garage Door Opener Accessory System features a wide variety of accessory options to enhance your garage door’s ability. From a retractable cord reel to Bluetooth speakers to parking assist lasers, it’s up to you how you want to customize your garage door. Open the door to possibilities!